After a hot summer, it’s refreshing to feel the crisp fall air and watch the leaves change color. To celebrate the new season, we’ve rounded up 6 festive activity ideas that you can enjoy with your older adult. They’re all simple, inexpensive, and fun! Coloring is an activity that everyone can enjoy, from the very young to the very old, both in groups or as a solo activity. As an added bonus, psychologists say that coloring has stress-busting abilities similar to meditating. Making and putting up fun decorations is a nice way to mark the change of seasons and get in the mood for fall holidays. It’s also a good opportunity to display some of those finished coloring pages! Sitting at the table with a warm beverage and a festive puzzle is a great way to celebrate the season. Baking, mixing, and assembly are fun activities that many older adults will enjoy. No bake pumpkin cheesecake – cheesecake, pumpkin, no baking…what could be better? If you’re planning to hand out treats to children in the family or neighborhood kids, your older adult might enjoy helping with the preparations. Someone with dementia might enjoy sorting a mixed bag of candy into different containers. It’s a great no-fail activity that helps them feel included – even if you don’t really need the candy to be sorted. 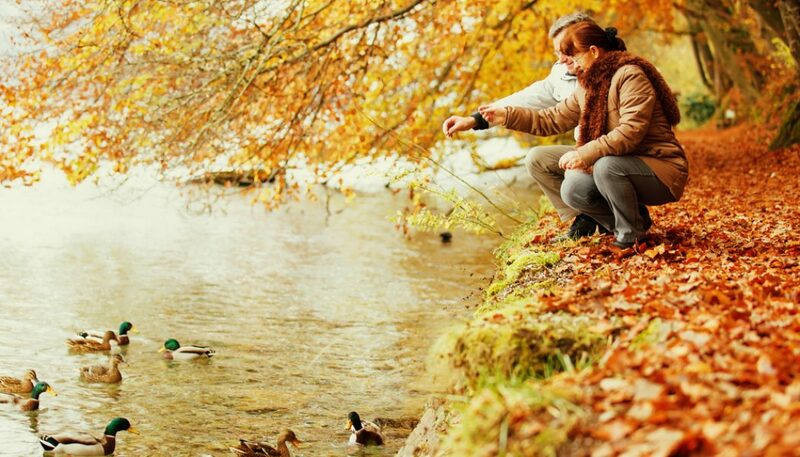 Fall is a wonderful time to enjoy nature with your older adult. Bundle up and breathe the fresh air, admire the beautiful colors on display, and hear the crunch of fallen leaves as you walk.